American Sign Language is more than just an assortment of gestures. It is a full-fledged unique language, with all the characteristics of such. 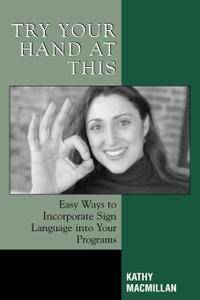 This helpful and user-friendly guide for librarians and other library personnel involved in library programming demonstrates everything from how to set up programming involving sign language for all ages to dealing with and paying interpreters. The book also discusses how to publicize programs to the public and within the deaf community and how to evaluate and improve the library's sign language collection. Kathy MacMillan's impressive understanding and knowledge of the deaf community and the importance of sign language_as well as her exceptional handling of the numerous erroneous myths about deafness and sign language that are, unfortunately, still often current_make this handbook an indispensable tool for all library personnel looking to reach out to the deaf and hard-of-hearing community.